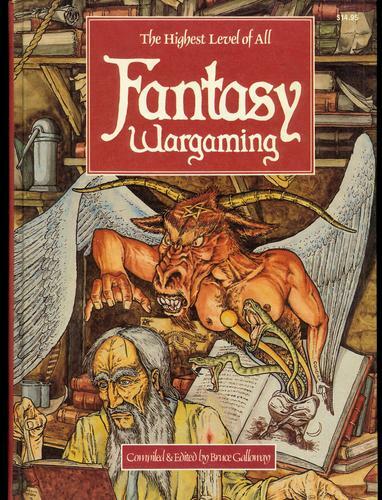 This is some very old news, but I’ve just noticed a DAISY version of the venerable early roleplaying game Fantasy Wargaming available for borrowing from the Internet Archive! DAISY, for those unfamiliar with it, is a “talking book” format developed for people with disabilities that prevent them from using printed books, such as blindness, dyslexia, and so forth. So really a DAISY book is much more than an audiobook (which would be a recording reading of a book). The DAISY format allows much more sophisticated manipulation of the text, both as audio (changing reading speeds, using searches or indexes, and so forth) as well as including image files for low-vision users needing larger displays. you will need to create an account to “borrow” it from the Internet Archive. I have not actually tested the DAISY file, and it is certainly easier for someone who can read a standard format book to obtain a copy (going for as little $5 on Amazon last I checked). But it’s pretty cool that someone took the time to make this book accessible to folks with disabilities.